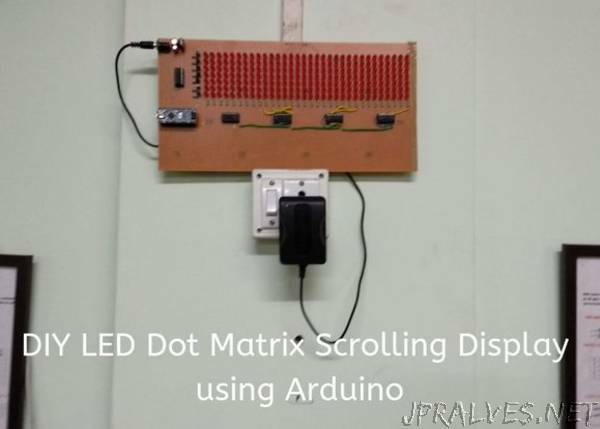 “In this Instructable, I will show how I make a DIY LED Dot Matrix Scrolling Display using Arduino as MCU. This kind of displays featured on Railway Station, Bus Station, Streets, and many more places. There usually Red LED dots which altogether makes a character. One by one character builds a sentence and the combination of those sentences display a message to the user. Here I am gonna make a 32 x 7 LED Dot Matrix Display which can show a combination of A-Z character, 0-9 numbers and some special characters.